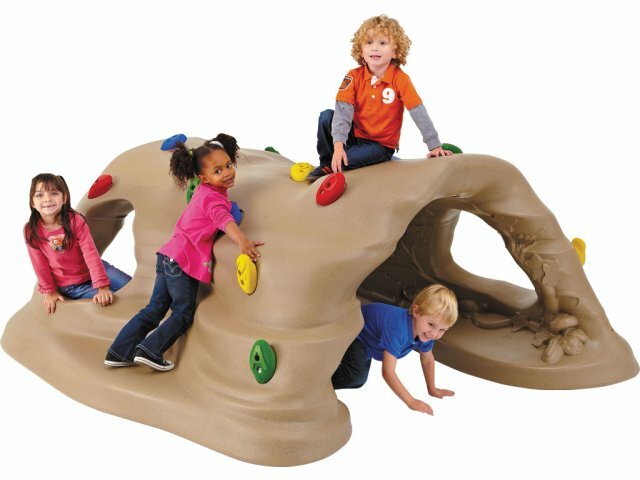 Add some variety to your playground equipment while encouraging exploration and skills development with the Climb and Discover Cave by UltraPlay. This play structure can occupy up to 9 children for endless fun and imaginative adventures. Young explorers will just love peeking inside the cave to find the hidden wildlife, insects, footprints and foliage. The outside features multi-colored hybrid plastic handholds which offer the excitement of a climbing wall while keeping children close to the ground. Concerned about maintaining appropriate supervision as children enjoy playground equipment? The Climb and Discover Cave features large openings and holes on either side so caregivers can easily view children at play. Ultra Play has been manufacturing outdoor recreation furniture for over 20 years. Made of top-grade steel with a no-peel coating, their products include benches, picnic tables, trash receptacles, food court furniture and more. High Capacity: Supports up to 9 children. Durable: Built with sandstone-colored, rotomolded plastic, and multi-colored hybrid resin handholds. Easy Supervision: Large viewing holes and wide openings enable caregivers to maintain a high standard of supervision. Educational Fun: The versatile design encourages motor-skills development, imaginative play and cooperation.